John Gregory has worked in the publishing and financial industries for over 20 years. He began writing for newsletters and marketing campaigns in 2003 and has since collaborated on pieces for Mortgage News and Mortgage Originator. He holds a bachelor's degree in geography from the William Paterson University of New Jersey. American football conjures many conflicting images: school spirit and team brotherhood on the one hand, trash talk and debilitating injuries on the other. This explains why the sport remains controversial despite its widespread popularity. On balance, however, football has more positives in terms of developing good citizens and leaders. In fact, numerous American presidents credit their successes to playing football while young men. Football fosters traits that cause players to stand out from the crowd. Physical strength, endurance, agility, speed and flexibility are all enhanced from participation on a football team. Most of these assets are gained in practice. Strength training through calisthenics and weights, plyometric drills, agility drills with tires and ladders, sprints and various stretching regimens are all incorporated into regular practice and running plays. Players must overcome fatigue, maintain concentration and remain prepared for surprises on the field in order to win ball games. This is instilled through repetition, the coach’s leadership and positive peer pressure. History provides ample record of teams defeating opponents of superior strength and ability through the sheer force of will power. Teamwork goes beyond a group deciding to work together. It is achieved when they do so smoothly and efficiently. A quarterback must have a feel for the speed and agility of his receivers. Likewise, defensive players must have a sense of where each teammate is in order to foil a play or limit yardage gains by the opposing team. When players see the advantage of cooperating in a single effort, they can utilize it in their academic and professional lives. Despite talent, drive and instinct, even the best players get frustrated. There is nothing like defeat to winnow out the ego, vanity and rigidness that can poison a football team. Whether a setback is suffered by an individual or the team as a whole, it can serve as a teachable moment for athletes. The Syracuse University team discovered this in the early 1990s, when a mediocre season followed on the heels of a successful one. 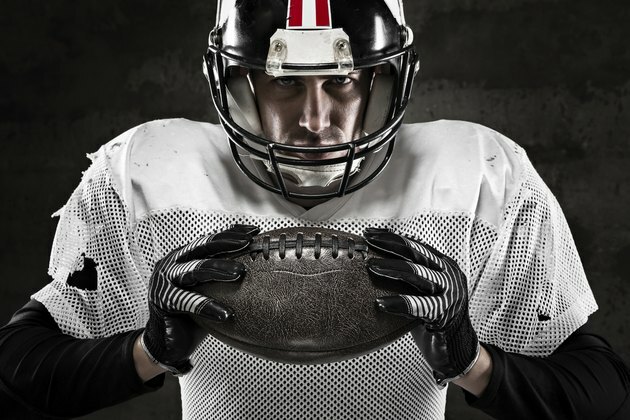 Though it is not classified as an extreme sport, football has the potential for serious physical harm. In fact, veteran pro players such as Troy Aikman believe the professional leagues have stepped over the line in terms of danger to players. Yet any game involving blocking and tackling is bound to carry risk. If responsibly managed, the omnipresent danger can serve as an opportunity for reticent athletes to face fears. Courage can not be forged in risk-free environments. Sharing in victories, defeats, sufferings, discipline and learning invariably forges bonds among players. The athletes learn to appreciate one another’s good points – and tolerate their annoyances. Former Indianapolis Colt Rob Morris recalls many friendships made with college and pro teammates, and credits them with having built his character. He does not miss the game so much as the company of his colleagues. Successful football players pay attention, not only to the play at hand but also to their surroundings. While a coach might call a play requiring the offensive backfield to rush to the quarterback’s left for a handoff or lateral toss, the defense might anticipate this and mirror the offensive movement accordingly. Consequently, the backfield players and the quarterback must react quickly with an alternative play. Enough of these scenarios make the senses more acute. Football improves analytical ability by forcing players to understand strategy and spatial arrangements. Certain patterns work best for certain player rosters. Defensive formations are based on the anticipated assaults of the offense. Newbies begin by doing what they are told. If they play long enough however, athletes begin to understand why a play is called and why one player might replace another for particular plays. Out of every football team will rise leaders. Those gifted with the ability to exhort, motivate and inspire often shine in the context of football. It is no surprise, then, that nine of the most recent American presidents either played or supported college football. Some want to win more; others will not abide laziness or bad attitudes. Whatever the motivation, leadership skills are developed in a football squad. Without a doubt, football commands the respect of a vast majority of people. Particularly on the scholastic and top-tier collegiate levels, football draws crowds far in excess of other team sports. The mental and physical toughness required by football has a peculiar appeal that makes the game an effective revenue producer. Those who excel on the gridiron can expect – and deserve – the respect of their communities.